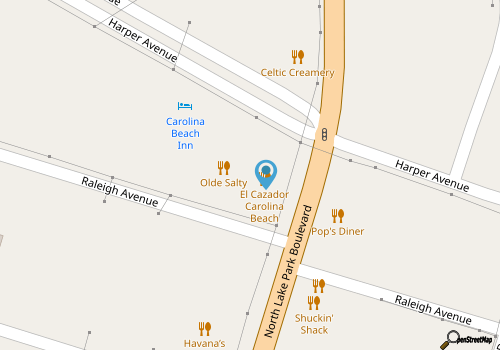 Carolina Beach vacationers who are craving a little Fresh Mexican fare, (which is understandable this close to the coast), can head to the centrally located El Cazador Mexican Restaurant. Found in the heart of Carolina Beach’s “downtown”-style shopping and dining region, this restaurant features all the staples, including big margaritas which are perfect for toasting another sunny day at the beach. The menu for both lunch and dinner is huge, and spans multiple pages with all the expected Mexican entrees and dishes. Lunchtime patrons will find a nice long list of specials that are rightly priced, and there’s even a special vegetarian menu that extends for a page, and includes fajitas, appetizers, and vegetarian combo meals. The rest of the menu is divvied up into tacos, tortas (sandwiches), steak dishes, chicken, Burros (or burritos), quesadillas, seafood, and combo meals, as well as a selection of chef specialties. For something that pairs nicely with the beach setting, opt for the traditional Tacos Mexicanos, which can be filled with shrimp, steak or even chorizo, or try the Tostadas de Ceviche with tilapia cooked with lime, cilantro, and tomatoes. It’s all filling and tempting, and will appease any Mexican food fan who needs to satisfy a spicy craving. Call (910) 458-5226 for current hours.